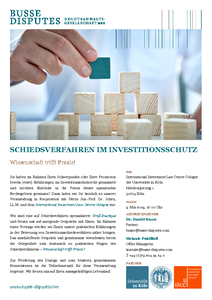 On 9 May 2019, lawyers of the law firm Busse Disputes will report on their practical experience in the supervision of investment arbitration proceedings at an evening event for students and doctoral candidates under the motto "Practice meets Science". The subsequent discussion and dinner will provide an opportunity for further exchange. Information on registration can be found here. 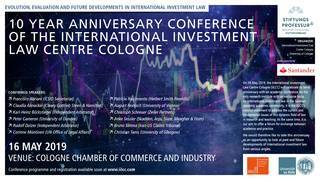 We are pleased to announce that on 16 May 2019 the International Investment Law Centre Cologne (IILCC) will celebrate its tenth anniversary with an academic conference. The conference programme with information regarding the registration for the event is now available.